John wouldn't let me leave the house yesterday morning without my "Mom" bracelet that he made for me at Divorce Care. We searched all over and I finally found it in my gym bag, slipped it on and headed out the door to drop my boys off at school. He was wearing his too. John was happy; we matched. Schedules change unexpectedly sometimes. Work was not on my schedule yesterday, but my boss asked if I would come in to cover a few hours for a co-worker who had broken her foot. Of course, I said, I didn't even have to think about it. So, I finished my short workday and headed to my usual lunch spot. Super Target is conveniently located close to my workplace. More often than not, I spend my lunch breaks in the Starbucks Cafe. Because of the rush this morning, I forgot to pack anything to eat. I had an hour before I needed to be en route to pick up the boys from school. I grabbed the cheapest low-calorie sandwich I could find in the deli, picked up a few toiletry items and checked out. Lunch time is busy at the Starbucks Cafe, I like sitting by the window, which was vacant. YES! 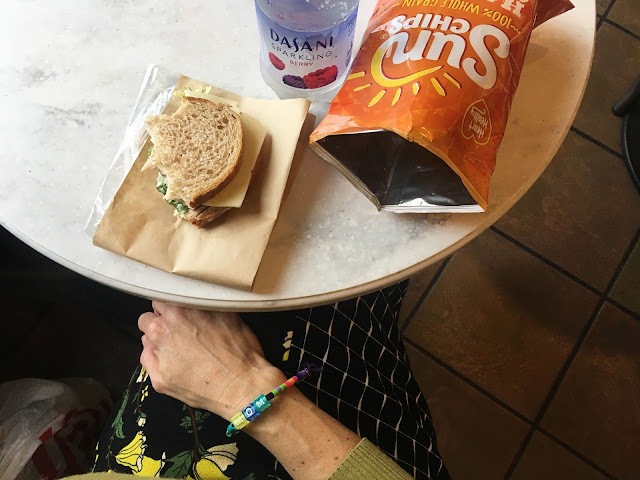 I dropped my things and set up my little lunch...I couldn't stop staring at my bracelet. I smiled at it, remembering. Julian, John and I started Divorce Care in the fall of 2016, the year I deemed for healing. I first heard about Divorce Care through a friend I made in my lifegroup from church. She suggested Divorce Care and gave rave reviews about the curriculum covered in the 13 week course. Yes, it's a class that meets once a week for 13 weeks. Each week has a theme that is studied during the week on your own and then discussed in group at the meeting time. There was an adult class and a children's class, so the boys and I could talk about the theme during the week together. I'll use another post to describe our experience, but let me share that it wasn't easy...it was brave though. It was brave that the 3 of us took Divorce Care. It's a brave act to get help where you need it. It's brave to accept an invitation from a friend who has your BEST interest at heart. It's brave to talk about the circumstances that make you sad, or angry, or indifferent. Can I offer you this? Can I offer this encouragement to you? If you have gone through a divorce or even a long-term cohabitation that ended in a breakup and you have children, consider seeking a church that offers Divorce Care. I didn't know how much we needed it until we started going. I didn't know how much we needed to talk about until we started this class. Divorce Care gives you the strategies and the Godly-wisdom to travel this broken road. It's not a magical class that will suddenly heal you and make your negative emotions go away, but Divorce Care proved to be a needed tool to help us along this path. We learned so much, the boys and I. Divorce Care was such a valuable experience, though difficult, I would even venture to take the class again. Whatever is brave, says so. Whatever is lovely or praiseworthy, share it. Whatever is helpful and wise, extend it. I love my "Mom" bracelet; I'm so thankful for this little reminder of a good decision we made while traveling a difficult road.